In a recent interview with Altitudes Magazine, Design Q CEO Howard Guy speaks about the quirky challenge to create the worlds first jet showroom for The Jet Business in London. Featuring a full size jet mockup in the shop front, its truly a spectacle. 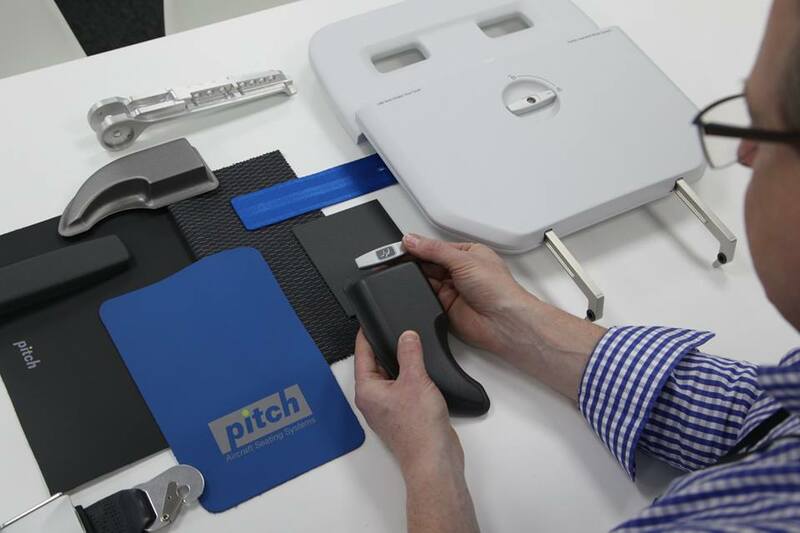 Design Q have been supporting PITCH Aircraft Seating to develop new ideas and materials for their customers as required. 'Product Surface' is a PITCH initiative to explore the application of enhanced surface finishes and branding on the PF3000 economy seat that was designed at Design Q. “We are always looking at ways to make a difference and test the marketplace with new ideas,” says Pitch director, Gary Doy. Gentleman’s magazine GQ spoke with Design Q about our recent Aerion interior design concept. The future or first class travel article showcased our interior design in a 2 page spread, alongside aviation manufacturer Airbus and rival design consultancies Mercedes-Benz and Pagani. Pick up Septembers issue to see the full story, or click the link below. In the latest Altitudes Magazine, Design Q CEO Howard Guy speaks about the collaboration with Comlux America and the idea to develop an interior design and floorplan concept for the next generation narrow body interiors; specifically the Airbus ACJ neo and the BBJ MAX 8 aircraft. Comlux America’s goal in this initiative has been to obtain designer perspectives and concepts to capture the different cultures, styles and tastes of potential VIP customers. Specifically, Design Q was required to develop unique rendering concepts for the Neo and MAX 8, each with unique materials, styles and concepts. “This is truly a mutually benefiting relationship, and something that has never been done before in our industry,” stated Scott Meyer CEO, Comlux America. “Comlux has a true admiration for all our industry designers and we were lucky enough to have these few key designers partner with us on this unique idea for next generation aircraft,” continued Meyer. Howard Guy, CEO at Design Q, recently spoke with Business Jet Interiors International Magazine to discuss the growing use of virtual reality within the Design Q studio, and how we use it within the aviation industry. Design Q has been featured on the cover of EVA Magazine's latest issue. EVA sat down with CEO Howard Guy to talk about some of our recent successes, including winning the design job to create the interior of Aerion's Supersonic Jet, in conjunction with Inairvation, and the build of the full size AS2 interior mock-up in our facility. On a lighter note, Howard also spoke about the adventures we are looking forward to in the next couple of years, creating innovative concepts, our deep understanding that design is more than skin deep, and the enjoyment we get when our clients are happy. The Aerion AS2 story has been featured in this months EVA International Magazine. Its an interesting read about an exciting project in Business Aviation. Design Q are Inairvation's preferred design supplier for interior design. “Once you go beyond the surface, you need an industrial designer and an engineer,” explains Howard Guy, director of the UK-based consultancy Design Q. Everything that goes into a plane has to be certified as aviation-safe and meet a raft of standards. The fabric covering your seats needs to be flame retardant. The foam inside the seats needs to be flame retardant. The seats themselves have to be bolted down and able to survive a 16G impact (humans rarely survive much above 10G).